Murphy Beds have been around for a long time but if you haven’t taken a look at them in the last 10 years, you should. Here are three reasons to consider installing a Murphy Bed in your home. Home design is changing. Homes are moving away from having single-use spaces such as formal dining rooms and formal living rooms. From entertaining in the kitchen to home offices that double as guest rooms, today’s homeowners are looking for multi-functional design of spaces within their home without sacrificing appearance. With a Murphy Bed, a home office, workout space or playroom can be transformed into a guest room for the occasional instances a guest bed is needed, leaving the room to be utilized by homeowners when the guest bed is not in use. The old joke featuring a person being folded into a Murphy Bed and into the wall couldn’t be further away from the truth. Murphy Beds are easy to use. Pull down and push the bed back into the wall with just a touch of your finger or, in some cases, the press of a remote button. So much easier that blowing up an air mattress when an extra bed is needed and much more comfortable for guests too. Worried that a Murphy Bed will look ugly or out of place? Murphy Beds can be custom ordered allowing you to choose the style, color and finish. This flexibility means it is easy to match the Murphy Bed to existing wood work or blend it perfectly into custom storage built around it like in the project featured below. Rather than looking out of place, a Murphy Bed opens up floor space leaving you a clean, uncluttered room to design, decorate and use as you wish. Thinking a wall bed might be the perfect solution for you? 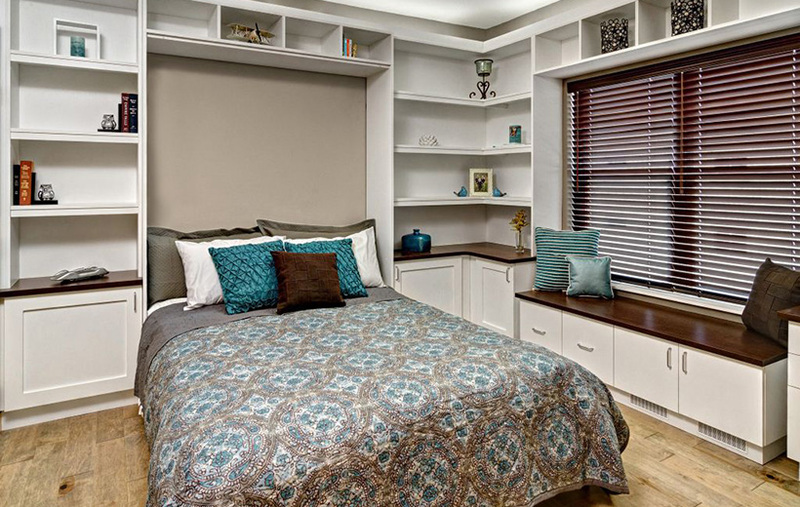 Visit our Murphy Bed project gallery for more ideas and inspiration and when you are ready, contact Closets For Life for a free-in home consultation!